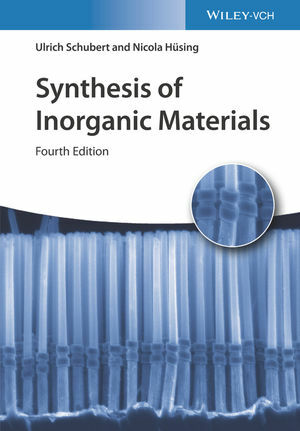 The fourth edition of this popular textbook is completely updated and includes a new chapter on self-assembly and self-organization. A must-have resource for students of chemistry and materials science, as well as researchers working in this pioneering field. Ulrich Schubert has been Professor of Inorganic Chemistry at the Institute of Materials Chemistry, Vienna University of Technology, since 1994. He received his PhD from the Technical University of Munich, under the supervision of E.O. Fischer. He then worked as a postdoctoral researcher with W.S. Johnson at Stanford University. From 1982 to 1994 he held a chair in inorganic chemistry at the University of Wurzburg, as well as various positions at the Fraunhofer Institute of Silicate Research in Wurzburg from 1989 to 1994. His research interests are centered around application-oriented fundamental research on solgel processes and inorganic-organic hybrid materials. Nicola Husing was appointed Professor of Materials Chemistry at the Paris-Lodron University of Salzburg, Austria in 2010. She received her PhD in 1997. The following year she was awarded a post-doctoral fellowship with C.J. Brinker in Alberquerque, USA. Returning to Vienna, she gained her lecturing qualification in 2003, becoming a full professor of inorganic chemistry at the University of Ulm one year later. Professor Husing's research interests focus on the liquid phase synthesis of porous materials, inorganic-organic hybrid materials and mesoscopically organized systems, especially with respect to synthesis - structure - property relations. This fourth edition contains the latest developments in the fast developing field and is completely revised and updated. A completely new chapter gives the reader a thorough introduction to self-assembly and self-organization. Other new content includes: demixing of glasses, non-classical crystallization, precursor chemistry, citrate-gel and Pechini methods, ice-templating and materials with hierarchical porosity.